Any cruisers or sailers, (or those maybe just interested), who would like to be included on an e-mail group list, for direct notification of latest information, are encouraged to contact me (bruneltower@aol.com) so your name can be added. SFCC members only need apply. Thank you. Subject - Sat 25th September 2010 - SFCC Yandle Trophy Cruiser Race - RESULTS. Subject - Sat 25th September 2010 - SFCC Yandle Trophy Cruiser Race. Please see links below for printable downloads of the paperwork for the above cruiser racing weekend. Dermot Nolan, SFCC Cruising Secretary. Subject - Sat 3rd / Sun 4th July 2010 - Exe Regatta. 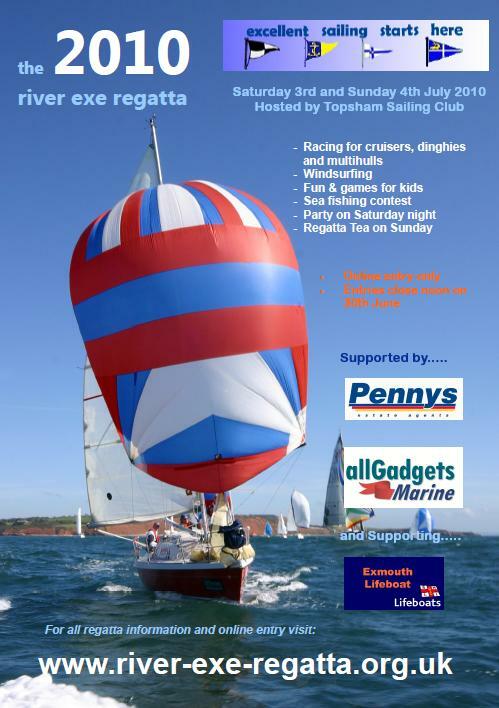 Cruisers/Sailors might best be served by going to the official Exe Regatta Website to see all that is planned for the weekend. Subject - Dartmouth Bank Holiday Cruise and Fishing Day. With a unsuitable forecast for the planned fishing day on Sunday it has unfortunately been decided to abandon the event this time around. Apologies for any dissapointment. Russ - PP Paul LeMilliere. Subject - SFCC Whitbread Cruiser Race - Results. Please see document download here for our 2010 Whitbread Race Winner. Peter Harris - Race Official. Subject - June 2010 - South Brittany Extended Cruise. Wednesday/Thursday 2/3rd June to Sunday 27th June. We are planning to leave in early June, crossing directly to either the north coast of Brittany, or round to Camaret. The trip will be approximately 3.5 weeks in duration. We will arrange to meet up with those from the Channel Islands Cruise who plan to join us. We hope to travel as far as Belle Ile, making a fairly fast southward passage, and a more leisurely return. Subject - Saturday April 24th 2010 - SFCC Whitbread Trophy Race. Subject - Saturday January 16th 2010 - Presentation Photos. For any who might have missed the front page link to the 2010 Presentation of Trophies photos, here it is again. Please click here for the webpage 2010 Presentation Photos. Anyone who would like personal photos from the night are encouraged to contact me at bruneltower@aol.com with your request(s). The 2010 list is now available to view and download online. Details from our 2009 season are now collated, and trophy recipients are known. However, all names will be remaining a secret until the night. As always there will definately be some suprise winners, and along with our special humour awards you can never really be sure of what you may get to take home. This is always a well supported evening for both fishermen and cruisers in the club, and the more of us that are there on the night the better, obviously. Dermot Nolan, Cruising Secretary, and John Astill, Fishing Secretary, both put alot of effort into this evening. Light buffet, after the presentation, will be served.